This is a very thoughtful photo of you! Thank you Peggy. I’m a very thoughtful cat, you know. As in, thinking lots of thoughts, not as in “being thoughtful” — although I can be that, too, sometimes! Boxes and cats are a great combination. Inside or out. Glad to hear that you are embracing change, Gary. 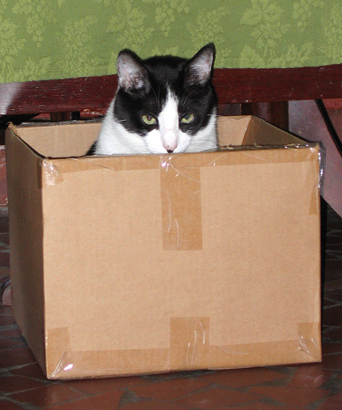 I think the whole cats and boxes thing may be in the genes. It’s like “see a box: jump inside.” This revelation came to me while I was thinking inside the box! How did I miss commenting on this post, Gary. That is a very handsome photo of you (though they all are). My girls like boxes too. And those reusable grocery bags – do you like them? Thank you Susan. A post without a comment from you is like a day without sunshine!